Diagnose common equine tumors accurately and find clinical information quickly!Clinical Equine Oncology describes the cellular basis of cancer and its etiopathogenesis, along with the principles of diagnosis, treatment, and management of cancer cases. This comprehensive resource offers more than just facts and diagrams - hundreds of detailed photographs make it easier to recognize and evaluate more than 50 types of tumors. It's useful to anyone working in the equine field, whether you re a veterinary surgeon, a practicing vet, equine dentist, or veterinary student. 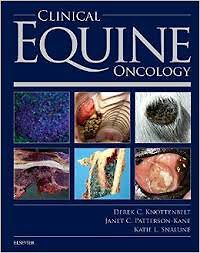 Written by a recognized expert on equine medicine, Derek Knottenbelt, this is the only book on the market that is completely dedicated to coverage of cancer in horses!